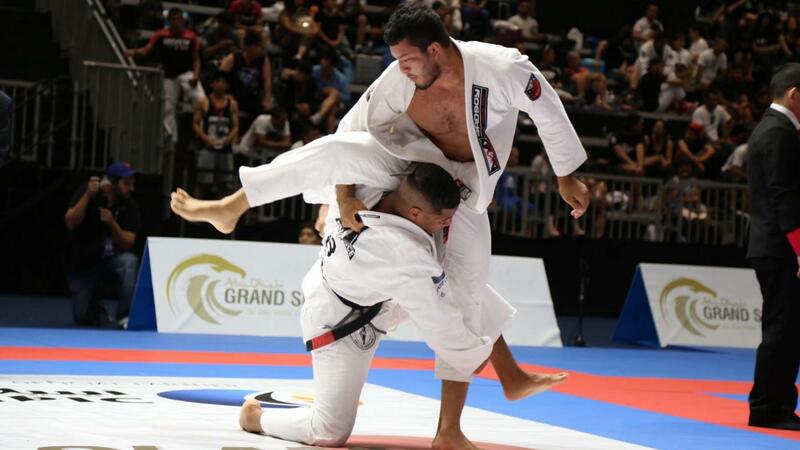 The 2017/2018 season of the Abu Dhabi Grand Slam Jiu-Jitsu World Tour opened this Saturday, July 15, in Tokyo, Japan. Over five hundred athletes from all over the world gathered at the Makuhari Messe for a full day of action on the seven mats set up in exhibition hall number 4. Competitors went after their share of over US$125,000 in prizes. As usual the highlight of the day was the black belt division, which featured fast-paced matches for the delight of the crowd present at the venue and also for the viewers all over the globe. Here's how each weight class played out. 56kg -In a all against all bracket, João Carlos Kuraoka won both her matches to climb to the top of the podium. He first beat Japan's Kei Ito 3-0 and then finished Masaaki Todokoro with a choke from the back. 62kg - For the pleasure of the home crowd, Japan's Kazuya Kawashima made to the title in two tough matches. He first beat his fellow countryman Hideyuki Yamada by referee decision in the semifinal. The gold medal match was against Brazil's Guilherme Carvalho. Behind in the scoreboard 12-4, Kawashima found a lapel choke to finish his opponent. 69kg - South Korea's Wanki Chae fought three times to reach the gold medal. First he finished Ricardo Yagi in the quarterfinals, then caught Mario Silva in the semifinal. The gold medal came his way with a 1-0 lead on advantages over Japan's Daisuke Shirake. 77kg - Roberto Satoshi was out to defend his title and things worked out just fine. In three matches, he first caught Matias Asencio with a triangle/armbar, then finished Kleber Koike also with a triangle to meet Tiago Bravo in the final. The gold medal became reality with a sweep and a 2-0 lead. 85kg - The most stacked division saw Isaque Bahiense have a flawless performance to win the gold medal. He met up with also favorite Lucas Barbosa in the semifinals and won by one advantage in a thrilling match. The final was against Jaime Canuto and the decision came down to the last seconds. With a 2-1 lead on advantages, Bahiense secured the title. 94kg - Marcos Sousa registered at the last second and made the division even tougher. In two matches, he caught Youngam Noh with an armbar in the semifinals and met up with the talented Adam Wardzinski in the gold medal match. With one sweep, Sousa built a 2-0 lead to win the title. 110kg - In a single match, South Korea's Dongwa Choi beat Brazil's Wanderson Amakawa 7-0 to win the gold medal.